Bling Baby - Who's a Rockstar? It's Finally Here!! THE MOST AMAZING ONESIE WE'VE EVER SEEN! 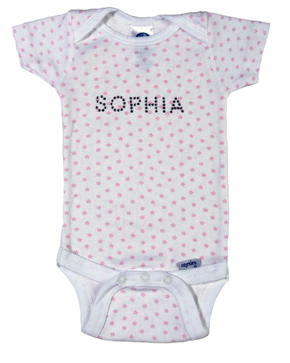 If you are a fashionista, then this is for your baby! Our little pink flowered onesie is soo cute that we want to frame it and put it on the wall for everyone to see... and then get another one for the baby to wear, of course! Created by a woman who is a fashionista herself and loves arts and crafts, this is the perfect match for her! There are many things to choose from, even adorable stuff for boys!